Schizomids are rare, small arachnids that are found in humid tropical and subtropical forests, mainly in leaf litter, caves, tree bark or under stones. They are all known as short-tailed whip scorpions due to the presence of a short flagellum—a lash-like appendage—in males and females. The flagellum of the male is held by the female's chelicerae—appendages in front of the mouth—during copulation in what is known as the mating march. But relatively little is known about the different shapes of male flagellum within Surazomus in terms of evolution, or the mechanism by which the female chelicerae anchor onto the male flagellum. 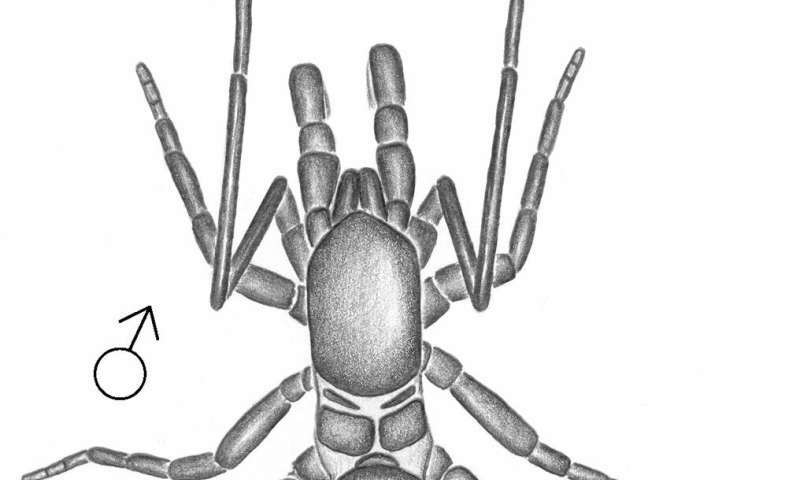 The authors named this new species, collected in the eastern Amazon, Surazomus saturninoae after arachnologist Dr. Regiane Saturnino, who collected the specimen on which the species description is based. S. saturninoae is less than 5mm long and the male of the species has a distinctive pentagonal flagellum, similar to those of three other species in the genus. The existence and placement of two coupling pockets on the male flagellum offers insight into the position of a couple in the mating march, in particular, how the female chelicerae anchor onto the male flagellum. According to the authors, the findings shed new light on the poorly understood mating march and evolutionary changes that may have occurred in the male flagellum within the Surazomus genus.